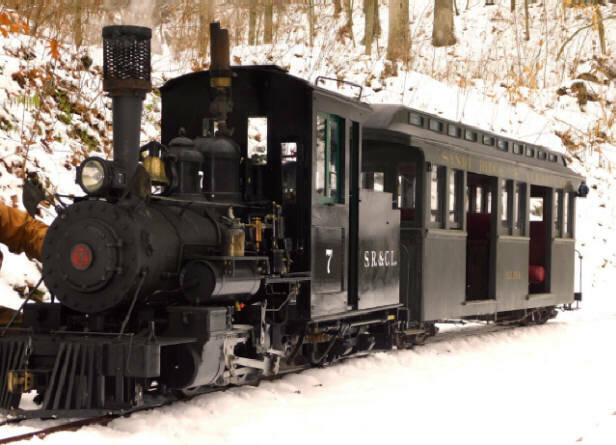 The SR&CL is an operating, narrow gauge railroad, with equipment patterned after the Maine Two Footers and built to 3 3/4" scale. The Route is point to point, with about 5400 feet of main line, 90 feet of elevation difference, and three branch lines. The railroad hauls firewood, logs and rock with some passenger traffic, along with the building materials for its own construction, which currently includes a new branch line. The railroad runs year round, including winter with plowing snow.